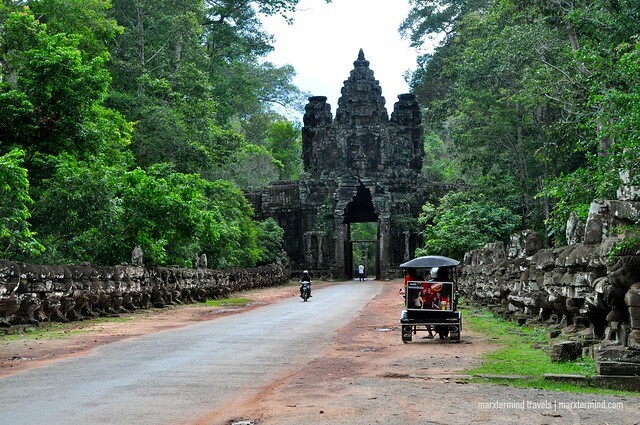 Most people rent a tuk tuk to explore Siem Reap. It is the most convenient and easiest way to get around. But if you’re feeling adventurous, there are fun and cheaper ways like bike and e-bike. Renting a bike was my first choice since I wanted to go around by my own. But I realised that it could be tiring since I have to pedal for several kilometres to get from one temple to another and then back to the town. So I decided to settle for e-bike. I was glad that e-bike is already being offered in Siem Reap. The first time I enjoyed riding one is when I was in Bagan. I didn’t have any idea how to operate it that time but I was able to learn it easily. E-bike is a bicycle that is run on electric power as well as by pedalling. Basically, it was like driving a moped. 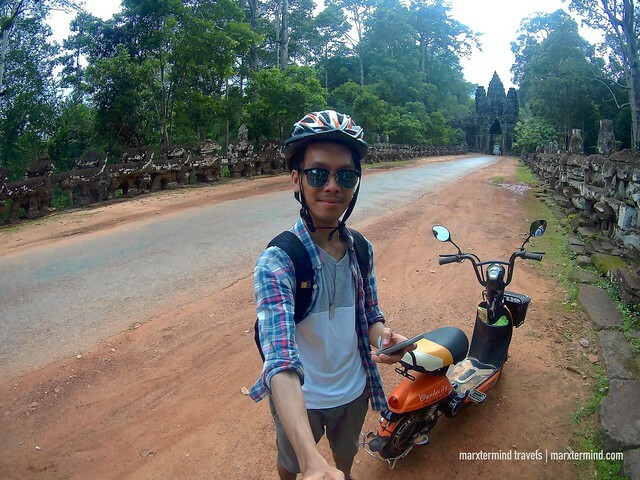 Renting an e-bike in Siem Reap is easy. You can go to the main shop or ask your hotel to contact the shop for you. I had mine at Ovelocity. The shop is located close to the town centre. I sent the shop an email prior to my trip that I would like to have an e-bike for three days. They picked me up from my hotel and brought me to the shop and there I filled up the form and checked the e-bike for condition or damage if there’s any. I was asked to leave my passport, which I was able to get back when I returned the vehicle. There’s also another option to pay $100 cash deposit, which is of course going to be returned when the e-bike is back. Rental is $10 per day. Only one person per e-bike is allowed. The price includes a lock and helmet. Charger for the battery is also provided. They have charging stations, which are indicated in the map. Battery can also be detached from the vehicle itself so I can also charge it in my hotel. I can also go back to the shop to have the battery replaced if needed. The e-bike can reach about 25 km/h but the average riding speed is 18 km/h to get the most range out of it. Riding distance is up to 45 kilometres per day, which I can already go for an easy ride up to Angkor Wat, Angkor Thom, East Baray and return to my hotel or to the shop. I started to tour the temples by noontime. I didn’t bother waking up early anymore for the sunrise since it was raining last night. It might just be the same like the last time I went to Angkor Wat for sunrise, it was gloomy and cloudy. 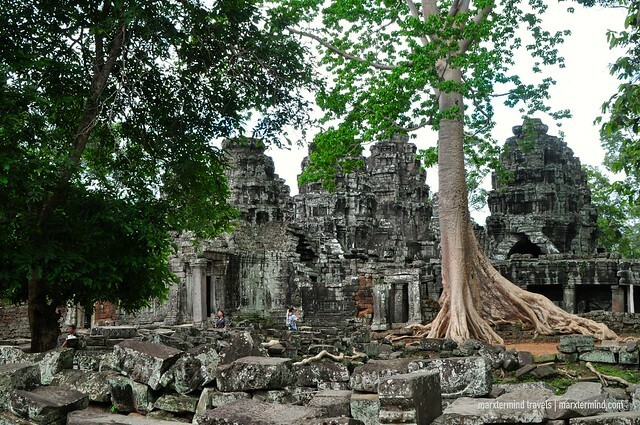 I only planned spending one day at Angkor Archaeological Park so I only bought one-day pass, which is $40 per person. 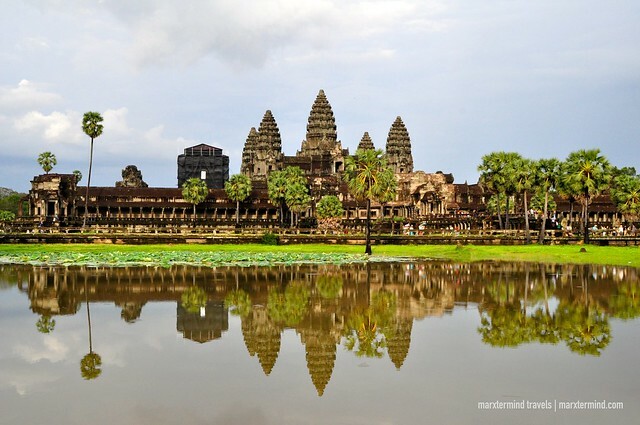 The pass can be purchased now at Angkor Panorama Museum, which is located along Apsara Road. I had about 5 hours, which means I had to skip lunch but good thing I bought some biscuits. Because of the limited time, I picked only few interesting temples to visit. I relied heavily on my map and to my GPS in my phone for my route and location of the temples. The park is really huge, and having just a half-day wasn’t really enough to cover everything. Even a whole day isn’t sufficient. 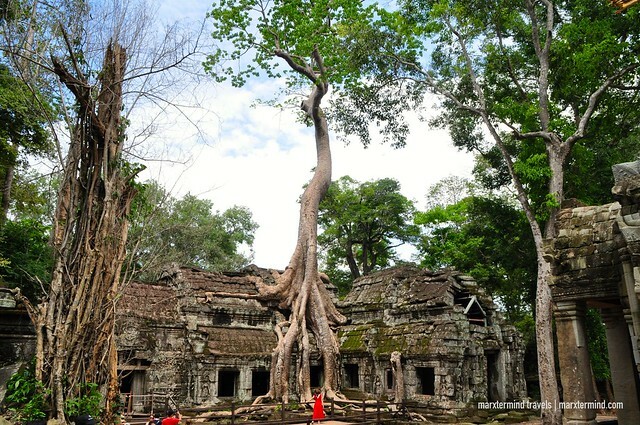 I suggest spending at least 3 days to see most of the temples in Siem Reap. 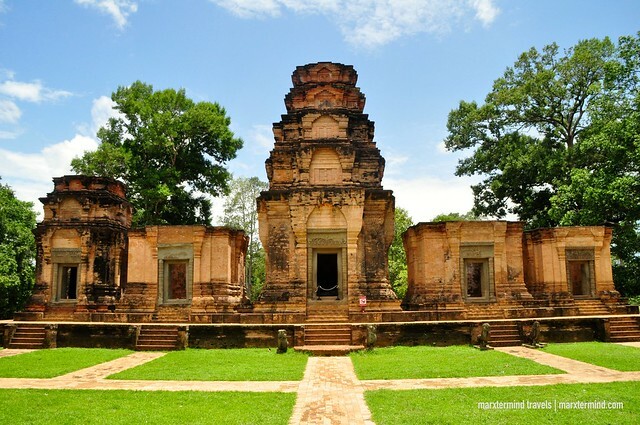 I started my route by visiting Prasat Kravan. This small brick temple is worth a 10-minute stop. It is along the road but it doesn’t get much visitors compared to other temples. The temple has detailed beautiful brick carvings that I found interesting. 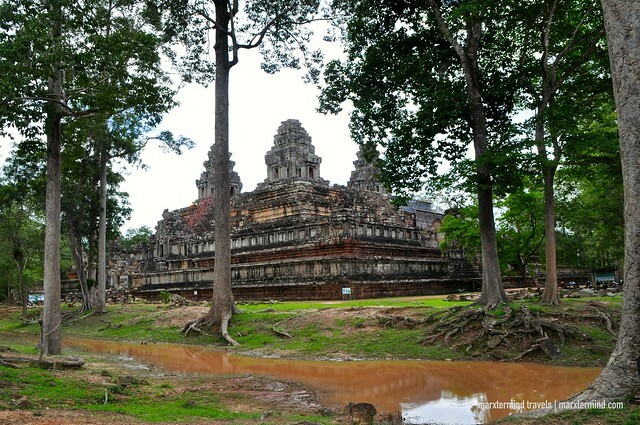 Afterwards, I went to Banteay Kdei, which is 5-minute drive from Prasat Kravan This temple has two entrance points. I entered through the back door because I only wanted to get to the main chamber, which is just about 2-minute walk from there. Banteay Kdei is a Buddhist Temple. It means “A Citadel of Chambers” and also known as “Citadel of Monk’s Cells”. Compared to the bigger temples, this place has also lesser people. I like the ancient trees. It was also incredible to see and be surrounded by glorious architectures of these chambers. 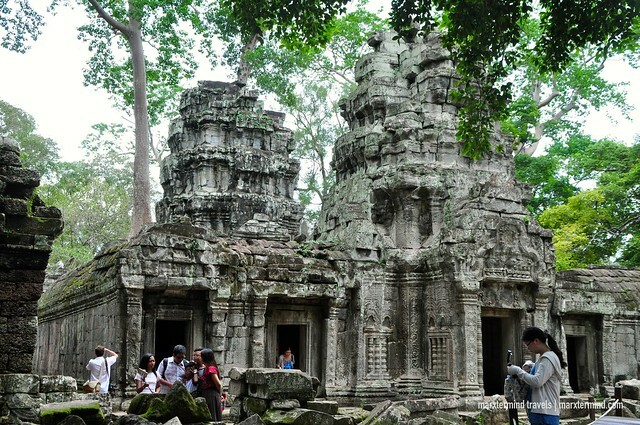 Ta Prohm is one of the temples that I would like to see again because of its mystery and beauty. 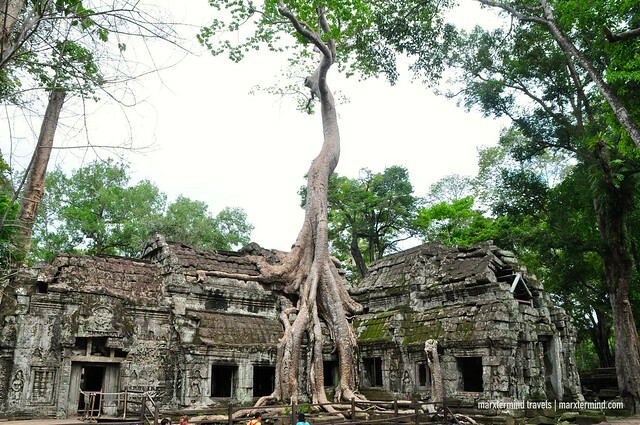 This temple is very unique because of the trees mounting out of the ruined structures. 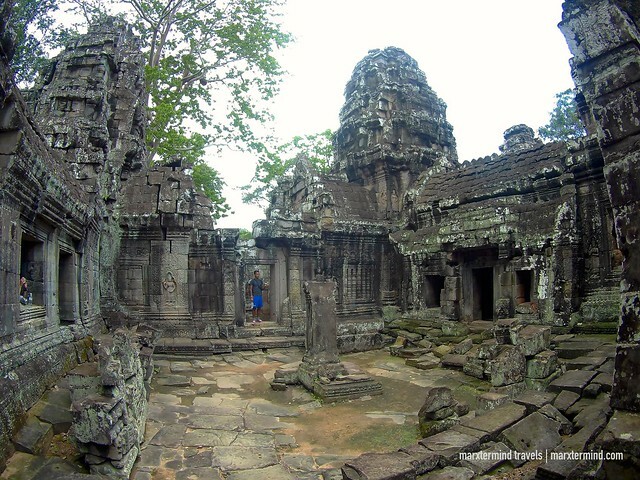 This is also one of the famous temples in Angkor Park not only because of its history but also because of its Indiana Jones feel. This place was also used as a location for Angelina Jolie’s film, Tomb Raider. As expected this place was very crowded. Taking picture was pretty tough. So after taking some few photos, I left and went to my next destination. 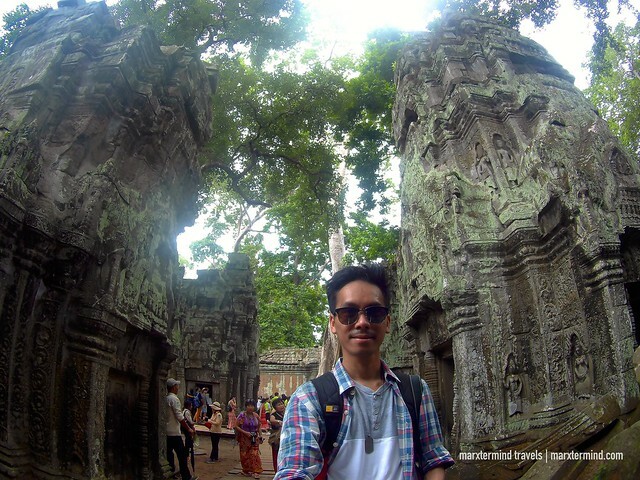 A few minutes’ ride from Ta Phrom, I reached Ta Keo. This structure is a temple-mountain that is said to be the first one to be built exclusively of sandstone. I like this temple because of its simplicity. 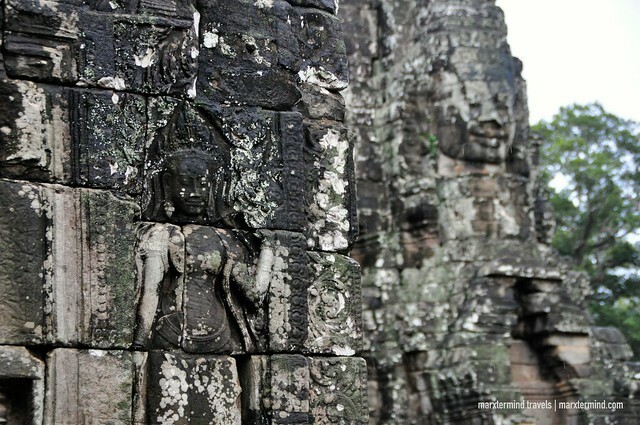 It lacks ornament but it is why it is distinctive compared among the other works of the Khmer. 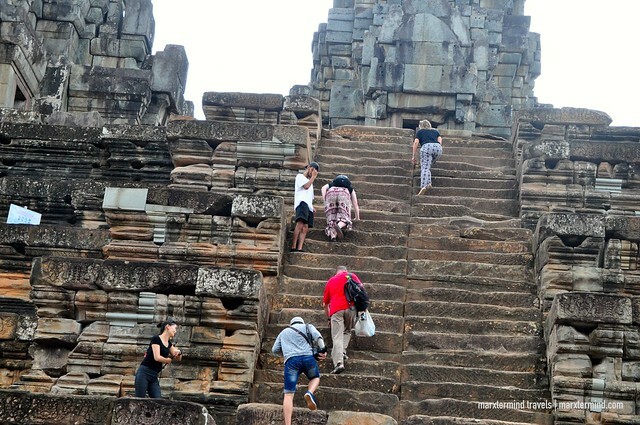 There are steep stairs going to the top that gives a stunning view but I didn’t climb anymore. 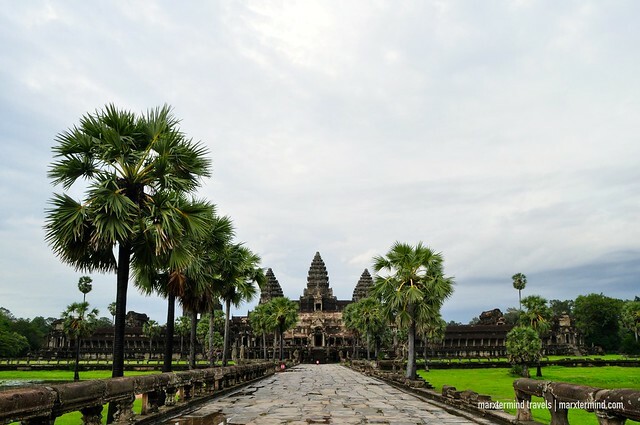 I didn’t go anymore as I was on a hurry to go to Angkor Wat before the closing time. 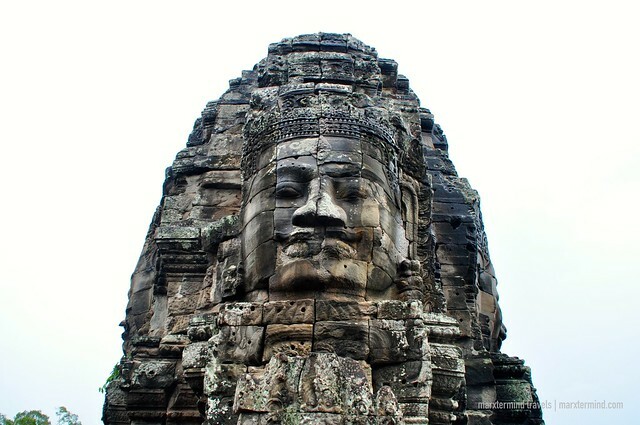 Bayon is a richly decorated Khmer temple known for its 200 large smiling faces carved into stonewalls. 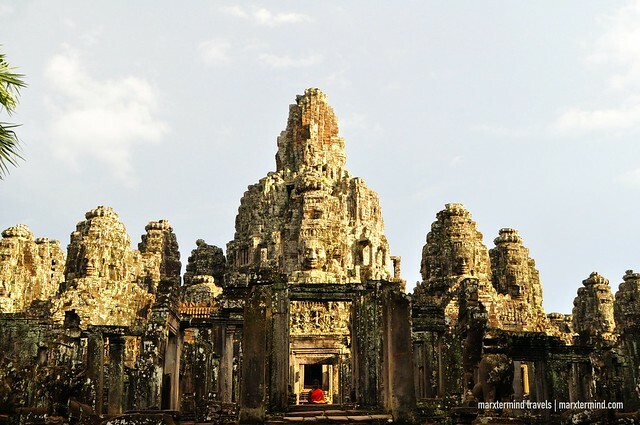 This temple is part of the huge complex called Angkor Thom, where Bayon is the state temple. 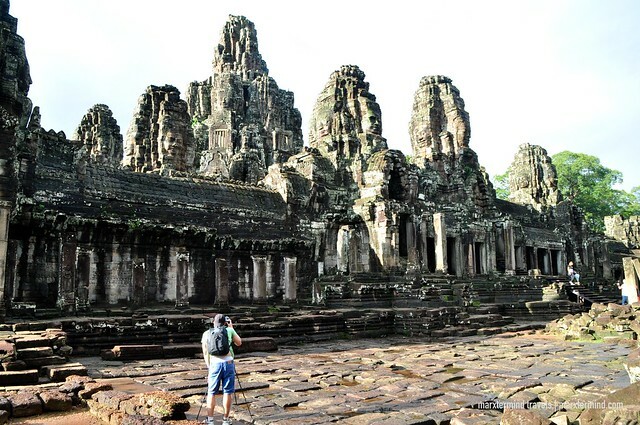 The temple is one of the most impressive temples in Angkor Thom because of the hundreds of faces of Buddha. I stayed here for an hour while I waited for the rain to stop. It also somehow became my rest period because I was already feeling tired from going to one temple to another. When the rain stopped, I went up to explore around. It was nice to see its spectacular architecture and special engravings. This one is really a good place to visit, not only to take some photos but to discover the history as well. About 10 minutes from Bayon Temple, I reached Angkor Wat. I only had 30 minutes to enjoy my last temple so after I parked my e-bike; I walked hurriedly towards the entrance gate. 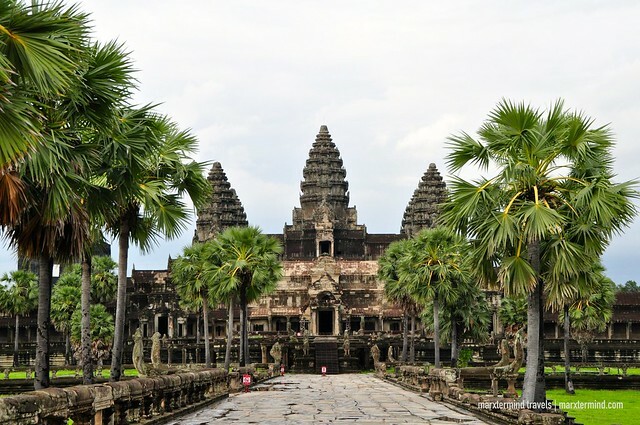 Angkor Wat means “Temple City” or “City of Temples” in Khmer. This is the largest religious monument in the world. 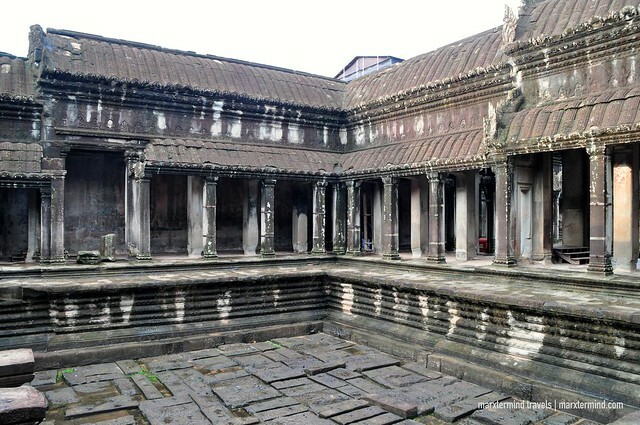 It is the prime example of the classical style of Khmer architecture. It has a unique combination of the temple mountain and the later plan of concentric galleries. Because the temple was too huge for me to get around, I anticipated that I wouldn’t be able to explore it fully. There are upper areas that I remembered that I went to when I was here with my friends the last time. I knew then I wouldn’t be able to visit that anymore. 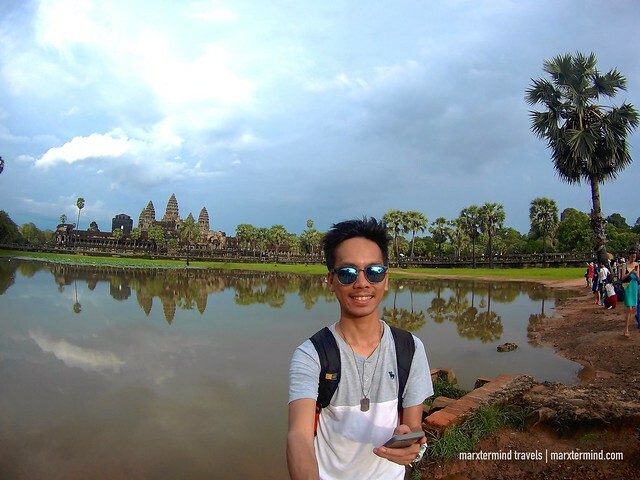 I went to the lagoon area first to have those typical photos that we see online of Angkor Wat. It was cloudy so I wasn’t expecting that I could get impressive photos of the temple. But I was still happy to capture it and had photos of myself with the peak of the temple on the background. The temple was about to close when I went inside the galleries. I was only able to see one part, which was somehow felt okay with me or maybe not. I hoped that I had more time to see Angkor Wat. Well, there was no one to blame but me because I started the tour late actually. After visiting Angkor Wat, I went to the parking lot and decided to go back to my hotel. 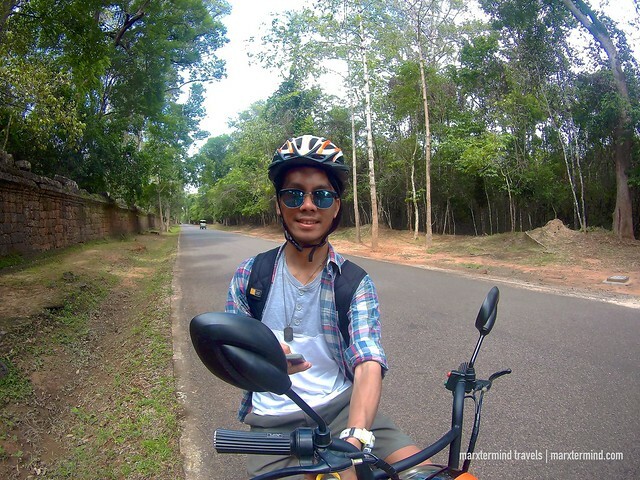 It was a fantastic adventure going around the Angkor Archaeological Park by e-bike. It was exciting and enjoyable ride. I enjoyed seeing the temples more this time because of the unique and adventurous experience. 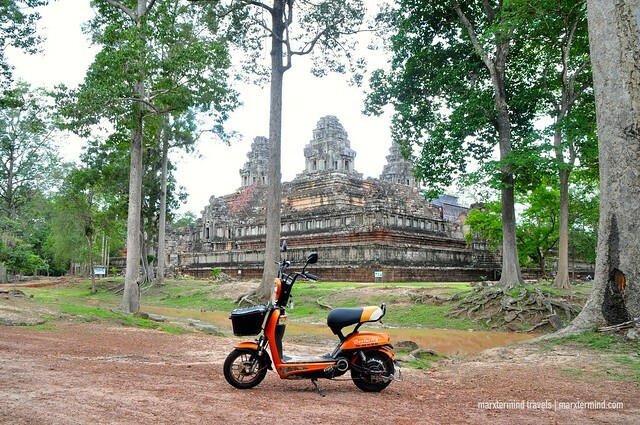 So when in Siem Reap, go for e-bike to have a fun and memorable tour of Angkor temples. Disclosure: My e-bike in Siem Reap was provided by Ovelocity. All notes and opinions are my own.